The Toronto Real Estate Board is reminding its membership not to compromise sales history. In light of sold data being opened after the Supreme Court of Canada last week refused to hear TREB’s appeal in its litigation against the Competition Bureau, brokerages began posting sold data within hours. However, according to the Tribunal Order, sold data can only be posted on password-protected virtual office websites. The country’s largest real estate board put out a FAQ about how brokerages are to proceed in presenting the public sold data. John Pasalis, president of Realosophy, a VOW that testified against TREB during the seven-year-long litigation, agrees with that a measure of responsibility is necessary in presenting sold data. The real estate board provided its membership with information and compliance guidelines, going so far as to threaten revoking membership and access to its MLS if guidelines are ignored. In a statement, TREB warned non-compliant individuals and service providers that it would pursue legal action against them. “We are working with our members to ensure TREB is in full compliance with the order. TREB has issued a document to our membership on the decision and what it means,” TREB President Garry Ghaura said in a statement. Dear Tony: Could you please explain the difference between sections, types and air-space parcels to our strata corporation of 171 units? Our property manager is insistent that if the residential and commercial agree, we don’t need to have a joint section council or meetings. We understood there was no choice. We have commercial offices, residential units and a restaurant. Since we started operating a few years ago, this has been a constant source of confusion over how bills are allocated, how decisions are made and who has voting rights at different meetings. Dear Karen: There is no such entity as a joint section. A strata corporation is created when the strata plan is registered in the Land Title Registry. It shows the boundaries of strata lots, common property, limited common property, residential and non-residential strata lots. The strata corporation must operate in full compliance with the Strata Property Act, regulations and any bylaws as amended by the owner developer or the strata corporation. In some circumstances, there may be minimal operating obligations for the strata corporation, but any common expenses such as insurance or any operating or utility costs not exclusive to a section are approved in the annual budget of the strata corporation, and the strata corporation must elect a strata council at its annual general meeting. Think of your strata corporation as the province of B.C. Sections are created through the bylaws and are like municipalities within the province. Those common exclusive expenses, bylaws and matters that affect only the strata lots identified in the section bylaws are approved by the section — in your case, the residential strata lots — and administered by the executive council elected at the AGM of the residential section. The same applies to the commercial section(s). In basic terms, a section can do anything a strata corporation can, but within the entity of the corporation. However, they are all separate legal entities. What this really means is you have three separate management contracts, three budgets, three councils, possibly three sets of bylaws or other matters that would be exclusive to one of your sections. One of the common misconceptions applied to sections is that costs may be allocated between sections based on the formulas filed in the bylaws. If the expense is not a sole expense of a section, it is an expense of the strata corporation and shared by everyone. The amount or ratio of cost is irrelevant and bylaws cannot reallocate common expenses. Types can be administered within the strata corporation or a section and they apply only to operating costs. For example, if only 25 units had access to natural gas for heating and fireplaces, the strata corporation may adopt a bylaw that creates the classification of types and only those 25 strata lots would pay for the gas based on their relative unit entitlement. Types are a simple method of allocating an operating cost only to those entitled users without the need for a higher level of administration. I have reviewed your registered strata plan and documents and discovered an error in how your strata corporation and sections are being administered. The restaurant is not part of your strata corporation. If you look closely at your registered strata plan, you will see it is a separate property, partly under your building, where an air-space parcel agreement was created. An air-space parcel agreement is an easement/contract filed on the Strata Corporation General/Common Index that defines how multiple property owners share use and liability of properties within the same air space. Your ASP sets out use of parking, shared cost formulas for joint areas and terms for shared liability. In your ASP, the restaurant owner has no voting privileges or rights to attend your general meetings of the corporation or sections, even though some of your current general meetings indicate they were at the meetings, made motions and voted on matters. It would be valuable for your strata corporation to speak with a lawyer to explain the formulas and obligations of the ASP to ensure the fees and allocations of costs and use are being properly administered. Go to www.choa.bc.ca and type in the search “Understanding Air Space Parcel Agreements” for an extensive guide on the subject. 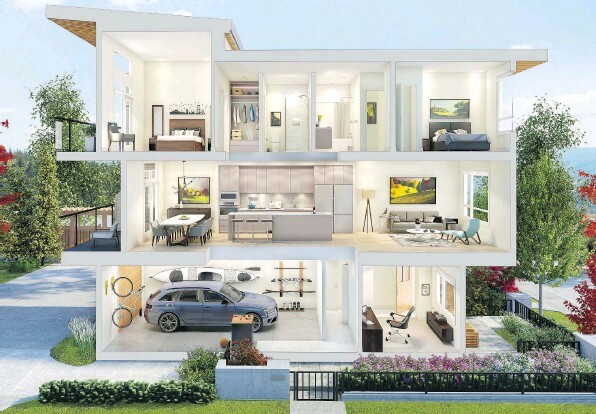 Dwell24, a project from Epix Developments and The Circadian Group, comprises 24 townhomes in Coquitlam. A bedroom imagined for a young occupant at Dwell24. Hours: Saturday — Wednesday, noon — 5 p.m.
With her deft handling of monochromatic shades, rich textures and innovative storage, designer Samantha Muller brings shape to the interiors at Dwell 24, a new townhome community in Coquitlam from Epix Developments and the Circadian Group. 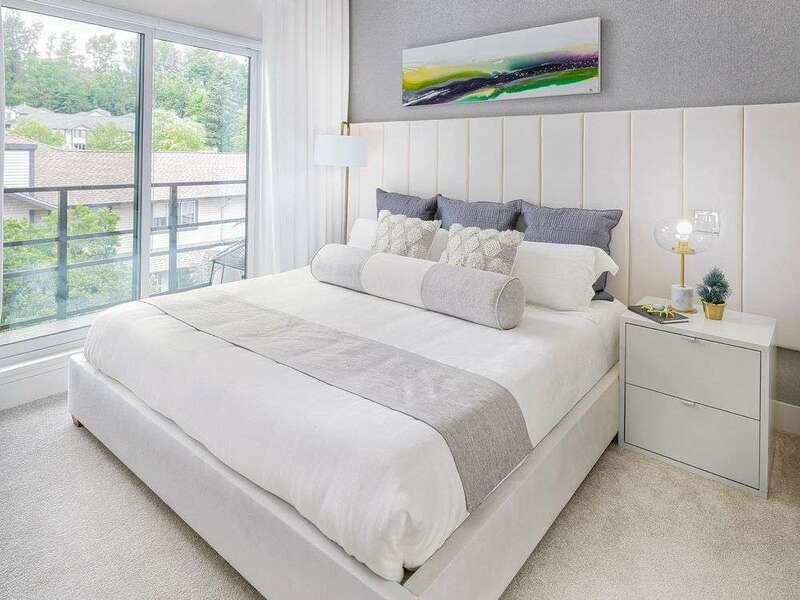 With her deft handling of monochromatic shades, rich textures and innovative storage, designer Samantha Muller brings shape to the interiors at Dwell 24, a new townhome community in Coquitlam from Epix Developments and the Circadian Group. Muller, a principal at Kleen Design, introduced subtle layers of shade and minimalist cabinetry to offer visitors ideas on how to make their home decor practical and beautiful. Kleen Design integrates storage into the decor of the spacious living rooms. Muller takes advantage of all the space available on a full wall, creating a “line” for the eye to follow from one area to another. 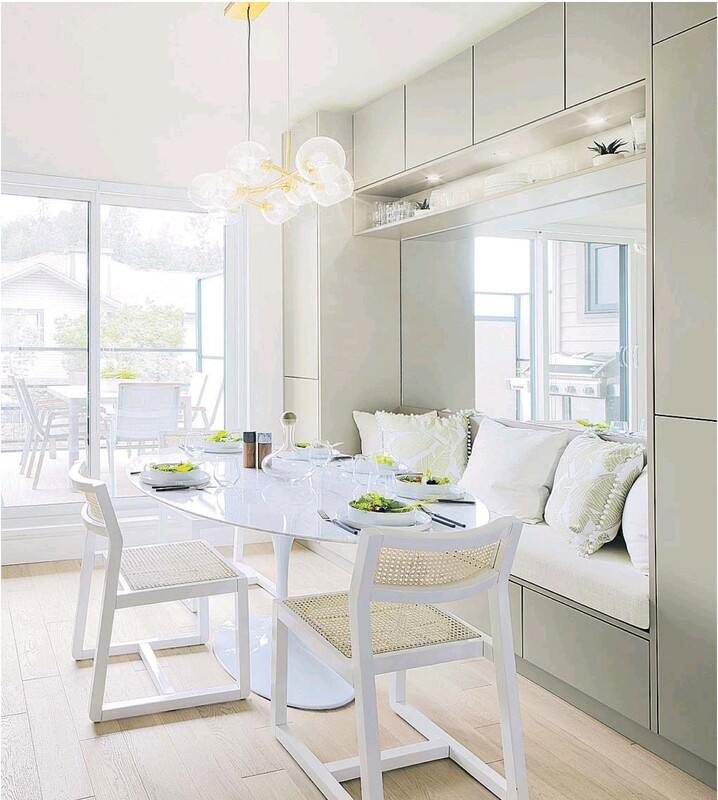 That banquette seating in the dining area is topped by a large mirror and features storage underneath. In effect, the entire wall in the dining area is lined with cabinetry. Muller has integrated the storage so well it becomes a vital part of the decor itself. “By designing practical storage for these homes, you can achieve the clutter-free look.” The kitchen appears larger with smooth finishes in light monotone shades. Muller describes it as “light, large, open utilizing a monochromatic palette, no visual pulls and integral fridge to visually expand the look of the space.” In one bedroom, a long plush panel stretches from one end of a wall to the next, a simple piece of decor that doubles as a headboard. Muller keeps the shades simple, restricted to whites and greys. Muller is both a stickler for detail and a fan of the big statement bound to capture visitors’ attentions. She points to an open staircase with a glass partition wall as one feature she’s particularly proud of. “Usually, this is reserved for single-family homes,” she says. “This detail really gives these homes a high-end single-family feel.” Dwell24 consists of five buildings and 24 three-storey townhomes. Homes have three or four bedrooms, single or double garages and decks or patios on every level. Potential homebuyers can see the entire layout of their homes in a cross-section diagram: it offers an effective way of showing a plan that shows potential occupants how they can relax, work and entertain in comfort. “It does give you a better idea of how you could utilize the space,” Muller says. In its latest analysis using data from CREA, Better Dwelling arrived at a surprising result: Vancouver was not even in the top three markets in Canada that had the strongest price growth. The study – which covered year-over-year figures up to July 2018 – reported that Vancouver exhibited only the fifth fastest growth rate nationwide in terms of home prices, at 6.68%. The city still remained Canada’s most expensive housing market, however, with an average price of $1,087,500. The other popularly acknowledged red-hot market, Toronto, had the third least affordable homes in the country at an average of $768,400 in July. This represented a slight 0.6% decline compared to the same time last year. Three other markets in B.C. posted the fastest pace of home price growth nationwide last month. Fraser Valley had the highest year-over-year increase at 13.83%, with an average home price of $831,300 that made it the second priciest across Canada. Coming up second was Vancouver Island, which had a 13.75% increase (up to $489,800). Just behind was Victoria with 8.24% growth (up to $672,800). Last week, for the first time in Canada, the general public could see exactly what any home sold for through the Toronto Real Estate Board (TREB), but that information is not permitted to be published by real estate agents in B.C. The release of sale price data in Toronto follows a Supreme Court decision August 21 in favour of a Competition Tribunal order that allowed publication of home sales price information. The decision forced TREB, which has been fighting against the ruling for seven years, to allow agents to make the information publicly available. A number of Toronto real estate companies and listing services immediately put the data online through password-protected sites. All the user has to do is register and provide a password to access the information. In a scroll through one listing service’s web page, it appears that most Greater Toronto homes are being sold for close to their listing price, which may not be the case in much of Metro Vancouver, where home sales have plunged about 32 per cent so far this year compared with 2017. John Barbisan, president of the Fraser Valley Real Estate Board, said his board cooperates with the Real Estate Board of Greater Vancouver and the Chilliwack Real Estate Board to provide Multiple Listing Service data in B.C.’s Lower Mainland. He said officials at all three boards have discussed the Competition Tribunal order, but could not say if or when sale price information would be accessible on agents’ websites in the region. In May this year, Glacier Media’s property portal REW.ca began listing sale prices and other information about homes in the Lower Mainland and southern Vancouver Island via its Property Insights pages. The free, non-registration service allows users to plug in an address to find the home’s most recent transaction history, including prices and dates (on completed sales of the property), as well as similar nearby listings and the median price of those listings, the home’s BC Assessment value and other data. A recent Angus Reid Institute poll has found that residents of Toronto and Vancouver are chafing from the pressure of the outsized housing price growth that has characterized the markets in recent years. The study also found that in both cities, residents indicated a desire for tighter housing policies at the federal and provincial levels, CBC News reported. Among their preferred measures are restrictions on the number of properties that foreigners are allowed to buy, and speculation levies for those who don’t pay provincial taxes. 56% of Toronto’s residents said that they are laboring under the burden of soaring home prices. 13% added that they would like to see costs fall by 30% or more, and 22% said that a 10% price decline can make ownership more accessible to would-be buyers. “The people of Greater Toronto are certainly more alive to [inflamed price growth] than they were three years ago,” the Angus Reid report stated. Toronto’s location was deemed the leading factor fuelling price growth, followed by low interest rates and foreign investors. As for Vancouver, Angus Reid found that nearly 75% of residents polled believed that housing costs have become “unreasonably high”. 20% of respondents said that prices need to shrink by 30% or more, while 29% said that their budgets would welcome at least a 10% drop. Vancouver’s home owners cited foreign buyers, wealthy investors, and the market’s desirable location as the top 3 factors propelling price growth. Everyone wants everything. Right now. For centuries, thinkers and philosophers have dreamed of a world where if you could think of something, you could have it—instantly. But now, that’s more than just a vision. Millions around the world simply can’t imagine any other way to live. And thanks to smartphones, they can get it. With more than 207 million smartphones in the U.S. today, 2 out of 3 people use one. They love the fast, satisfying technology. But even more than that, they love the promise: Getting what you want, with a few touches. Today, not tomorrow. A successful business is an accelerated business. Spotify, Netflix, Amazon Go, Uber and the entire mobile banking industry have all built their reputations on instant gratification. And now, real estate is joining the party, too—if you’re ready. We asked 476 real estate agents how on-demand technology has changed client relationships. Results were surprising. Posted in Technology Related Articles | Comments Off on How has the on-demand economy impacted real estate? You are currently browsing the Les Twarog Vancouver Real Estate and Condo Blog blog archives for August, 2018.